Osseointegration is defined as "the structural linkage made at the contact point where human bone and the surface of a synthetic, often titanium based implant meet." 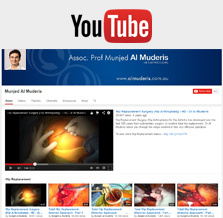 Through this surgery A/Prof Munjed Al Muderis and The Osseointegration Group of Australia provide above and below knee amputees with a leg replacement using the OGAP-OPL implant which is designed to be as close to the human anatomy as possible. The surgery involves an implant being inserted into an amputee’s femur which, when integrated with the bone allows for a simple, quick, safe connection between the stump and the lower prosthesis. Osseointegration surgery provides amputees with greater mobility, comfort and quality of life. Please find below information on osseointegration, what to expect prior to and during surgery as well as post surgery recovery information. For more information or to book a consultation to assess whether osseointegration is right for you please contact A/Prof Munjed Al Muderis' office on 1800 907 905 or +61 2 8882 9011 or book an appointment online.